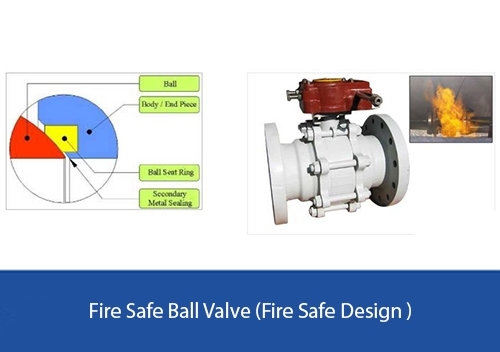 J D Controls manufacturing Fire Safe Ball Valve as per API 607 standard in Full / Reduced Port with Antistatic Device, Blowout Proof Stem with various choice of operation. J D Controls mfg. both Floating & Trunnion Mounted Fires Safe Ball Valves. In the floating ball design, where sealing takes place by allowing the Ball under pressure to move towards the downstream seat to effect tight seal. For higher sizes and pressure ratings Trunnion mounted ball valves are preferred by industry. J D Fire Sate Ball Valves are generally supplied with manual Hand Lever or Gear Operated, depending on valve size. J D also offering Ball Valves with either Pneumatic (Double Acting / Single Acting – Spring Return) or Electrical actuator operated for automation. J D Fire Safe Ball Valves are also available with different type of Seat, Seal & Packing material such as P.T.F.E. (Virgin) / Glass Filled P.T.F.E. / Carbon Filled P.T.F.E. / Graphite (Grafoil) / PEEK to suit special requirement of client. Fire Safe Design Confirms to API 607, Valves are tested and Fire Safe certified by Bureau Veritas. Multiport Fire Safe Ball Valves, Valves with Extended Stems, Valves for Underground Applications etc. also available on request.